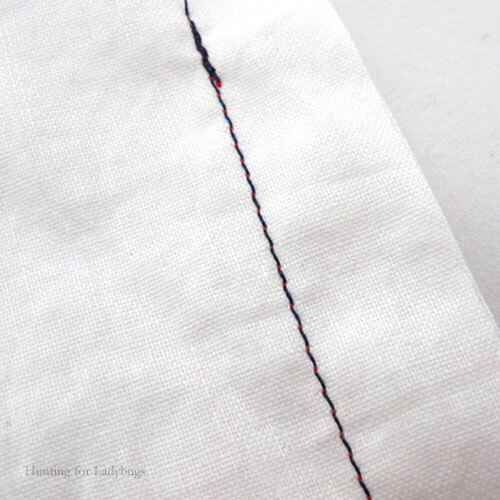 Ever wondered how to make your line of stitching nice and straight (relatively speaking)? The secret is to not watch where the needle is going up and down; it will do that regardless of what you do. Instead focus on where the edge of the fabric is tracking, which is the bit you do have control over. 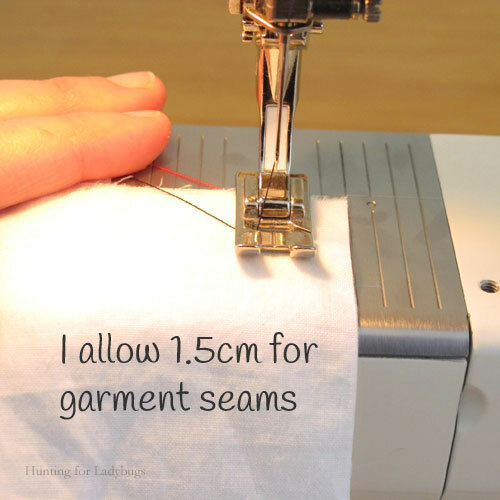 Most sewing patterns will refer to a seam allowance. This means how much fabric should be between the edge of the fabric and your line of stitching when sewing two bits of fabric together – i.e. 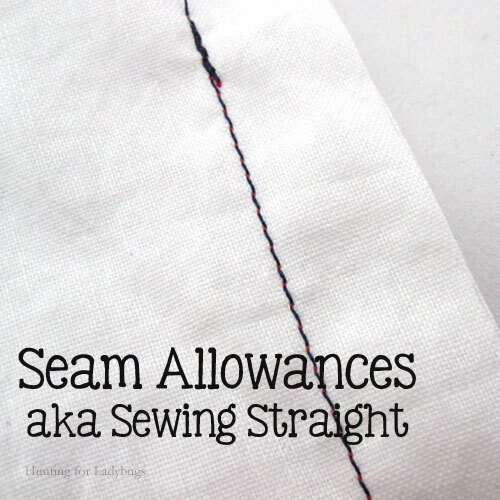 the allowance for making a seam. Seam allowances are important to give strength to your join. 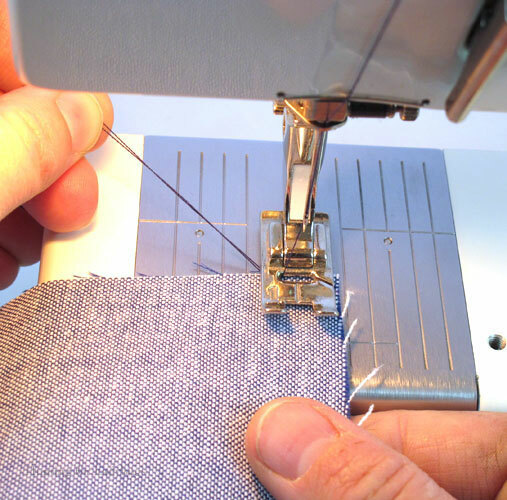 If you sew too close to the edge – or use a narrow seam allowance – then your fabric might fray and your seam will split open. Too far from the edge – a wide allowance – and your garment or object will be too small and may affect the fit. Your sewing machine has a needle plate. This is mine. The metal plate is etched with lines – these are your seam allowances. My machine is a Bernina, and made in Switzerland, so it has metric seam allowances – see how my grooves line up nicely with each 0.5cm. Your needle plate may or may not have tiny numbers showing the allowances which is rather handy. 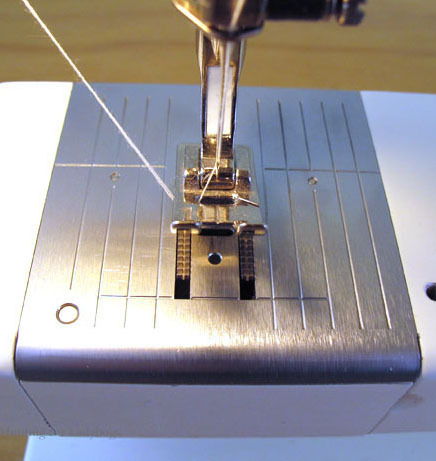 Right – when you’re ready to start sewing, slide the fabric in under a raised presser foot. 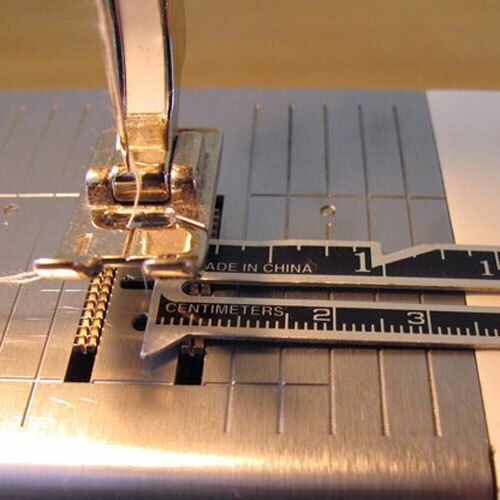 Line up the fabric edge with the correct seam allowance mark on the needleplate (use a ruler or tape measure to check – place zero at your needle) and lower your presser foot to hold it in position. Hold your thread tails and gentle push down on your foot pedal to begin stitching. 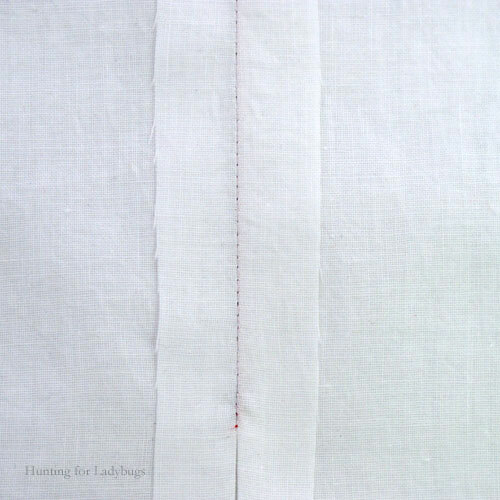 For this example I was using a 1/4″ seam allowance (which is actually the allowance I use most often). 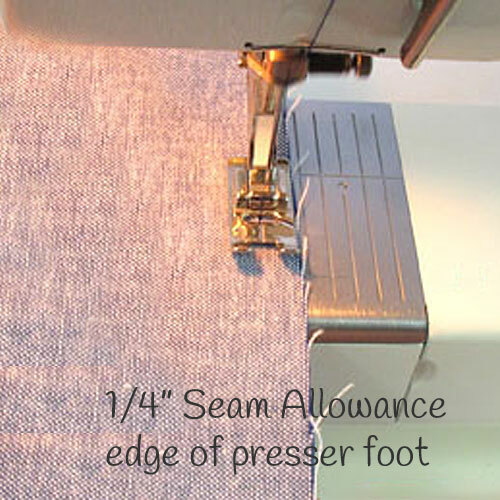 I am lucky to have a 1/4″ presser foot on my sewing machine so I just run the fabric edge along with the edge of my foot. Tip: Stick a piece of masking tape on your needleplate to mark your seam allowances if you have trouble seeing the groove. After 2-3 stitches forwards, sew another 2-3 stitches in reverse to form an anchoring backstitch. I find it’s best to hold my hands in this position while I sew. 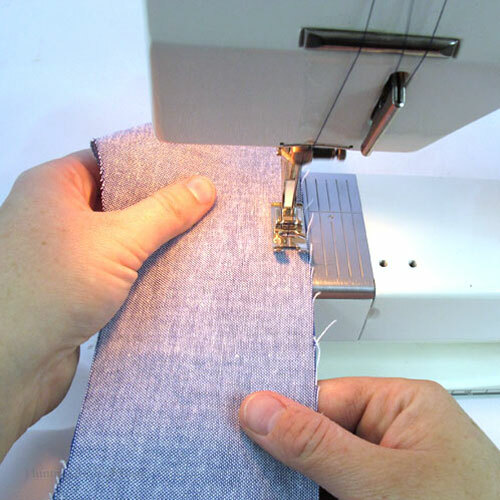 You don’t want to push or pull the fabric under the needle – the machine needs to pull it under in it’s own time to make the stitches even (sometimes thick layers of heavy fabrics like denim need a bit of a tug). 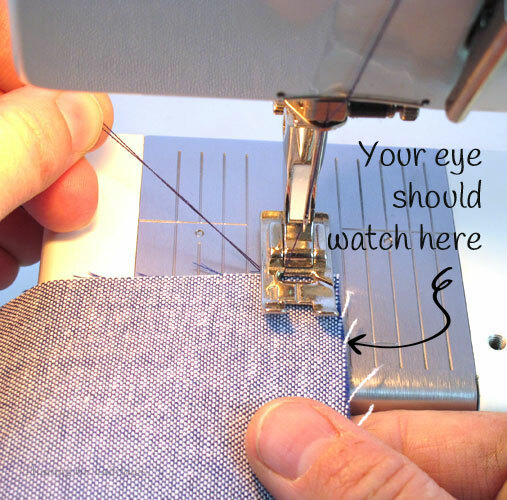 Carry on sewing to the end of your seam – watching and making sure that the fabric edge stays aligned with the seam allowance mark. Backstitch again 2-3 stitches from the end. When you stop sewing, make sure your needle is in the upmost position. Having your needle at the top will loosen the tension discs to allow you to pull the thread through. Raise your presser foot, pull your fabric out from the machine and trim threads. Ta Dah! A nice straight seam. Here’s a wider seam. This time I’m using 1.5cm so I line the edge of the fabric up with the second line to the right of my needle position. Here it is pressed open (aka ironed flat). 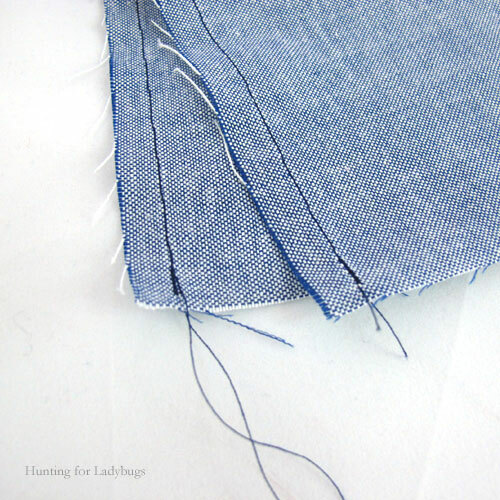 It’s important to keep the same distance from the edge so make your sewing line nice and straight while also allowing your seams to stay strong. 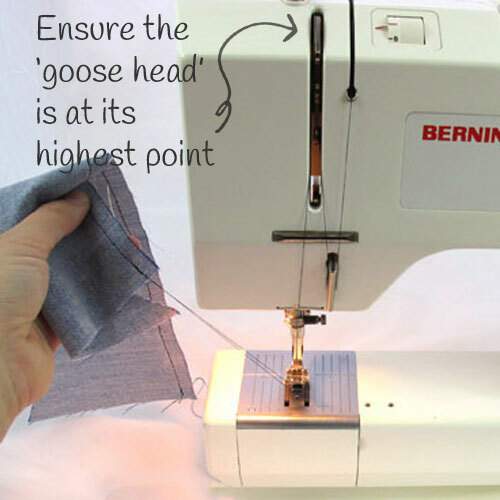 There are marks on your machine to help you stay a set distance from the fabric edge. Which line you follow depends on the directions given in your pattern. Watch the mark and not the needle while you guide the fabric along and you’ll have nice straight even seams. Start slow and steady; you’ll get faster with time and practice. It’s okay to wobble off course but, like driving, try to come back to your mark with a easing sort of motion rather than a sudden jerk across (if that makes sense?!). Thanks for dropping by for a visit Hope ~ Mending is an important sewing skill to have.